Are you the classiest, sassiest Cowgirl to ever sit a saddle? Carry this beautiful purse and you are sure to feel like you are. 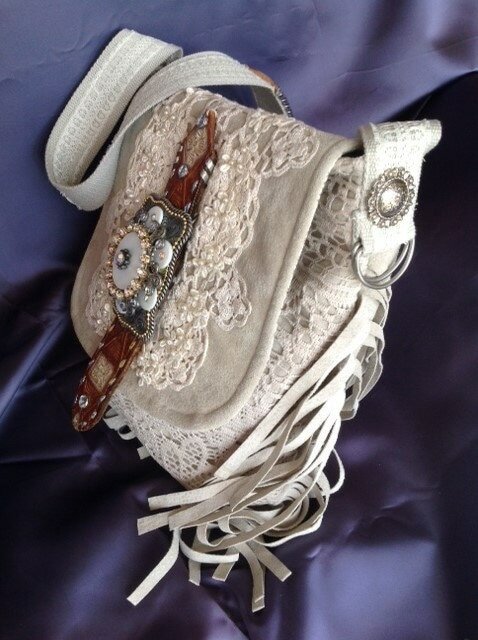 This purse is a wonderful fusion of suede and lace. Add in some rhinestones, a rodeo belt buckle, carved western leather belt trim and you have a union best described only as,,,”Western Chic”. Designed by me, completely handcrafted by me, possibly one of my finest creations. This purse was designed with a very special lady in mind. Are you that lady? 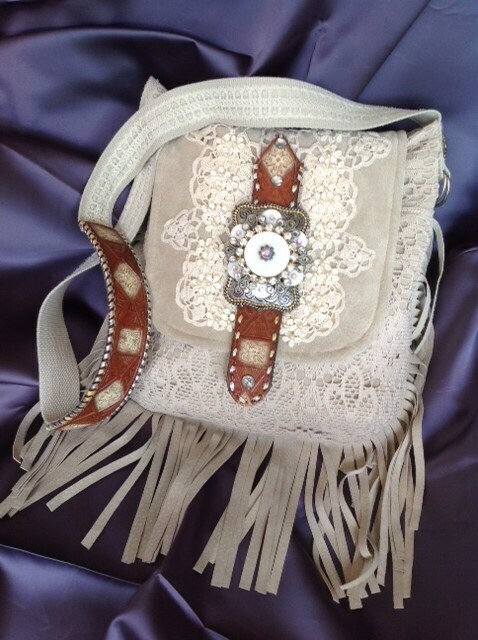 The main front/back body of the purse is made of cream colored suede, with an overlay of lace over the front of the purse. 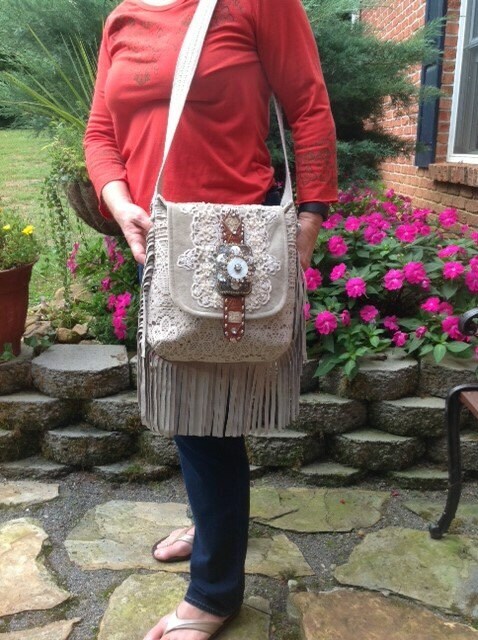 Added around the sides and bottom of the purse is 5 1/2" suede fringe. The front of the flap is suede adorned with a vintage doily, lace appliques and each pearl has been hand sewn onto the lace. A piece of carved and painted western belt was attached and crowned with a beautiful western buckle loaded with rhinestones. 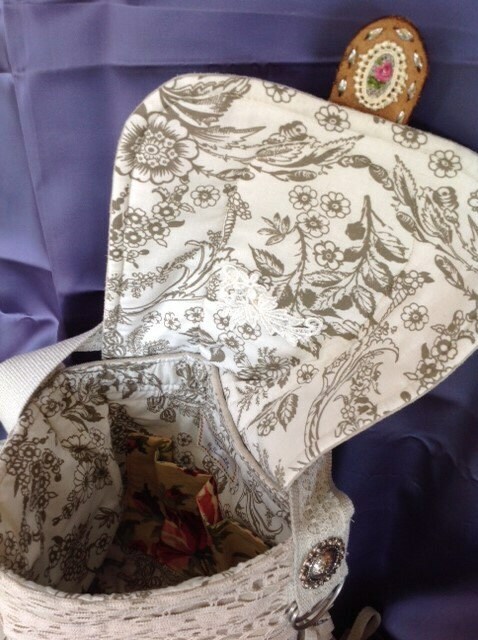 The inside lining is an off white and dark tan cotton fabric floral print. The inside split pocket is made of a colorful rose print. The strap is a canvas and lace belt with a piece of the same carved belt that is on the flap. 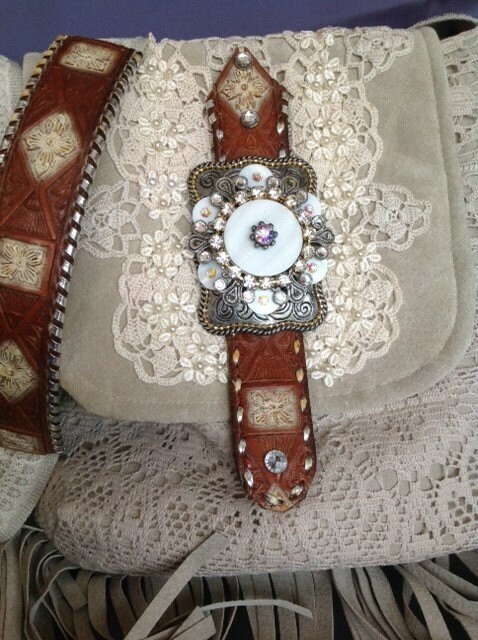 A silver Concho is attached at each side of the purse where the belt is attached. Purse Dimensions; Purse Body is 12" wide X 12 1/2' Tall Strap is 41" Long Fringe length is 5 1/2"
An absolutely beautiful, Handcrafted, Southwestern Purse.